Everyone of us would love to do it, wouldn't we? But our voices are suppressed so much that many people carry a block in their throat, which is more emotional than physical. Osho Multiversity offers many courses that help people remove their blocks and help the energy flow freely. One such course is Finding Your Voice Finding Your Song. Recently people from 8 different countries and four different continents participated in a fun-packed intensive at OSHO International Meditation Resort this last weekend culminating in a heart-warming performance on Monday night. 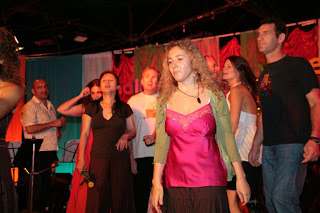 This 4-day course is an invitation for everyone to reconnect with their unique instruments (themselves) and their potential for sound and singing. “In a place like this where the focus is on meditation and celebration, music is a wonderful tool to explore and express ecstasy and silence,” says Satyam the course facilitator. In these four days participants start “making friends” with their voices through playful singing games and interactions. “Many people arrive feeling inhibited – they only sing in the shower or alone in the car, or maybe not at all. In this course by creating a trusting and light-hearted environment people soon open up and soon find themselves performing uninhibitedly with a microphone and then creating their own song inspired by some beautiful words of Osho,” says Abhijat, who has assisted in the course many times. Watching these people sing joyously one thinks why can't everyone sing like a bird? Osho says, "If we can destroy the inferiority complex... which is very simple: the teachers and the parents just have to be aware not to impose themselves on the helpless children. And just within two decades the new generation will be free of the inferiority complex. People will express their creativity. There will be musicians, there will be dancers, there will be painters, carpenters. There will be all sorts of creativity around the world. But nobody is competing with anybody else; he is simply doing his best. It is his joy. The joy is not in competing, the joy is not in coming first; the joy is in doing it. It is not outside the act, it is intrinsic to the act."